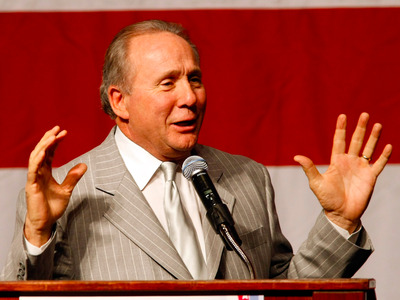 Late President Ronald Reagan’s son blasted presumptive Republican presidential nominee Donald Trump on Tuesday, saying the whole family is insulted by comparisons some have made between the two. Trump has been running on the old Reagan slogan “Make America Great Again,” and he often extols Reagan as a great president. But it seems that the affection does not go both ways. “His grandchildren are, in fact, insulted that [people] would compare Donald Trump to their grandfather,” Michael Reagan told NewsMax TV on Tuesday, as spotted by Buzzfeed. In an apparent reference to Trump’s legendary brashness, Michael pointed out that Reagan worked with Democratic House Speaker Tip O’Neill even though they had their differences. Michael, a conservative strategist, has bashed Trump frequently in the past. He said on Twitter earlier this week that he wouldn’t be voting for Trump in the California primary, and he told Politico last year that Trump “takes all of the air out of the room” for other Republicans. Another Reagan son, Ron, similarly opposes Trump.